The UIViewController class defines the shared behavior that is common to all view controllers. You rarely create instances of the UIViewController class directly. Instead, you subclass UIViewController and add the methods and properties needed to manage the view controller's view hierarchy. Responding to user interactions with views. Resizing views and managing the layout of the overall interface. A view controller is tightly bound to the views it manages and takes part in handling events in its view hierarchy. Specifically, view controllers are UIResponder objects and are inserted into the responder chain between the view controller’s root view and that view’s superview, which typically belongs to a different view controller. If none of the view controller’s views handle an event, the view controller has the option of handling the event or passing it along to the superview. View controllers are rarely used in isolation. Instead, you often use multiple view controllers, each of which owns a portion of your app’s user interface. For example, one view controller might display a table of items while a different view controller displays the selected item from that table. Usually, only the views from one view controller are visible at a time. A view controller may present a different view controller to display a new set of views, or it may act as a container for other view controllers’ content and animate views however it wants. Every app contains at least one custom subclass of UIViewController. More often, apps contain many custom view controllers. Custom view controllers define the overall behaviors of your app, including the app’s appearance and how it responds to user interactions. The following sections provide a brief overview of some of the tasks your custom subclass performs. For detailed information about using and implementing view controllers, see View Controller Programming Guide for iOS. Each view controller manages a view hierarchy, the root view of which is stored in the view property of this class. The root view acts primarily as a container for the rest of the view hierarchy. The size and position of the root view is determined by the object that owns it, which is either a parent view controller or the app’s window. The view controller that is owned by the window is the app’s root view controller and its view is sized to fill the window. Specify the view controller and its views in your app’s Storyboard. Storyboards are the preferred way to specify your views. With a storyboard, you specify the views and their connections to the view controller. You also specify the relationships and segues between your view controllers, which makes it easier to see and modify your app's behavior. To load a view controller from a storyboard, call the instantiateViewController(withIdentifier:) method of the appropriate UIStoryboard object. The storyboard object creates the view controller and returns it to your code. Specify the views for a view controller using a Nib file. A nib file lets you specify the views of a single view controller but does not let you define segues or relationships between view controllers. The nib file also stores only minimal information about the view controller itself. To initialize a view controller object using a nib file, create your view controller class programmatically and initialize it using the init(nibName:bundle:) method. When its views are requested, the view controller loads them from the nib file. Specify the views for a view controller using the loadView() method. In that method, create your view hierarchy programmatically and assign the root view of that hierarchy to the view controller’s view property. All of these techniques have the same end result, which is to create the appropriate set of views and expose them through the view property. A view controller is the sole owner of its view and any subviews it creates. It is responsible for creating those views and for relinquishing ownership of them at the appropriate times such as when the view controller itself is released. If you use a storyboard or a nib file to store your view objects, each view controller object automatically gets its own copy of these views when the view controller asks for them. However, if you create your views manually, each view controller must have its own unique set of views. You cannot share views between view controllers. A view controller’s root view is always sized to fit its assigned space. For other views in your view hierarchy, use Interface Builder to specify the Auto Layout constraints that govern how each view is positioned and sized within its superview’s bounds. You can also create constraints programmatically and add them to your views at appropriate times. For more information about how to create constraints, see Auto Layout Guide. When the visibility of its views changes, a view controller automatically calls its own methods so that subclasses can respond to the change. Use a method like viewWillAppear(_:) to prepare your views to appear onscreen, and use the viewWillDisappear(_:) to save changes or other state information. Use other methods to make appropriate changes. As of iOS 8, all rotation-related methods are deprecated. Instead, rotations are treated as a change in the size of the view controller’s view and are therefore reported using the viewWillTransition(to:with:) method. When the interface orientation changes, UIKit calls this method on the window’s root view controller. That view controller then notifies its child view controllers, propagating the message throughout the view controller hierarchy. In iOS 6 and iOS 7, your app supports the interface orientations defined in your app’s Info.plist file. A view controller can override the supportedInterfaceOrientations method to limit the list of supported orientations. Typically, the system calls this method only on the root view controller of the window or a view controller presented to fill the entire screen; child view controllers use the portion of the window provided for them by their parent view controller and no longer participate directly in decisions about what rotations are supported. The intersection of the app's orientation mask and the view controller's orientation mask is used to determine which orientations a view controller can be rotated into. You can override the preferredInterfaceOrientationForPresentation for a view controller that is intended to be presented full screen in a specific orientation. When a rotation occurs for a visible view controller, the willRotate(to:duration:), willAnimateRotation(to:duration:), and didRotate(from:) methods are called during the rotation. The viewWillLayoutSubviews() method is also called after the view is resized and positioned by its parent. If a view controller is not visible when an orientation change occurs, then the rotation methods are never called. 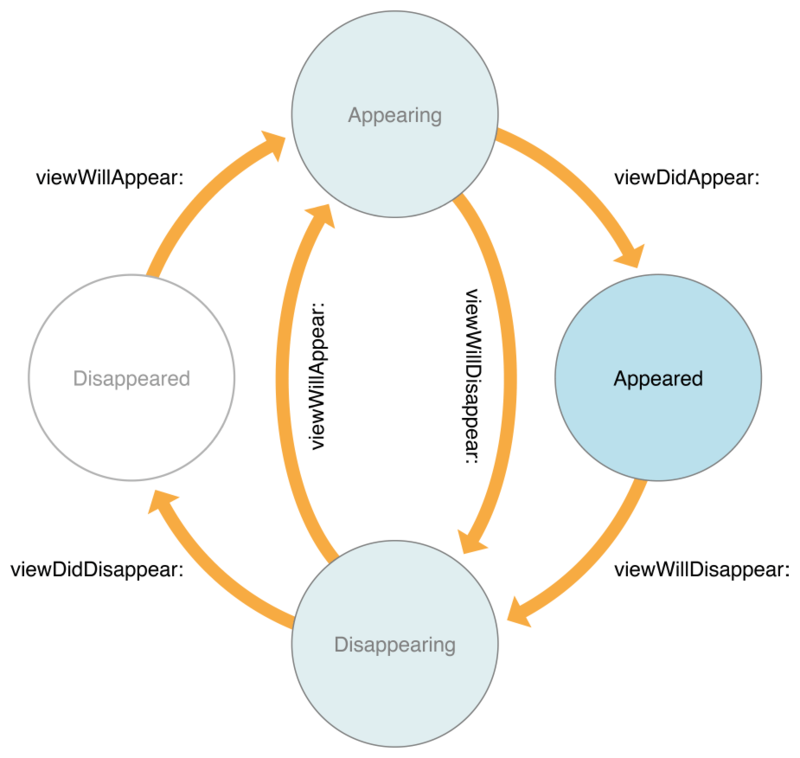 However, the viewWillLayoutSubviews() method is called when the view becomes visible. Your implementation of this method can call the statusBarOrientation method to determine the device orientation. At launch time, apps should always set up their interface in a portrait orientation. After the application(_:didFinishLaunchingWithOptions:) method returns, the app uses the view controller rotation mechanism described above to rotate the views to the appropriate orientation prior to showing the window. A custom UIViewController subclass can also act as a container view controller. A container view controller manages the presentation of content of other view controllers it owns, also known as its child view controllers. A child's view can be presented as-is or in conjunction with views owned by the container view controller. Your container view controller subclass should declare a public interface to associate its children. The nature of these methods is up to you and depends on the semantics of the container you are creating. You need to decide how many children can be displayed by your view controller at once, when those children are displayed, and where they appear in your view controller's view hierarchy. Your view controller class defines what relationships, if any, are shared by the children. By establishing a clean public interface for your container, you ensure that children use its capabilities logically, without accessing too many private details about how your container implements the behavior. Your container view controller must associate a child view controller with itself before adding the child's root view to the view hierarchy. This allows iOS to properly route events to child view controllers and the views those controllers manage. Likewise, after it removes a child's root view from its view hierarchy, it should disconnect that child view controller from itself. To make or break these associations, your container calls specific methods defined by the base class. These methods are not intended to be called by clients of your container class; they are to be used only by your container's implementation to provide the expected containment behavior. You are not required to override any methods when creating a container view controller. By default, rotation and appearance callbacks are automatically forwarded to children. You may optionally override the shouldAutomaticallyForwardRotationMethods() and shouldAutomaticallyForwardAppearanceMethods methods to take control of this behavior yourself. Memory is a critical resource in iOS, and view controllers provide built-in support for reducing their memory footprint at critical times. The UIViewController class provides some automatic handling of low-memory conditions through its didReceiveMemoryWarning() method, which releases unneeded memory. If you assign a value to the view controller's restorationIdentifier property, the system may ask the view controller to encode itself when the app transitions to the background. When preserved, a view controller preserves the state of any views in its view hierarchy that also have restoration identifiers. View controllers do not automatically save any other state. If you are implementing a custom container view controller, you must encode any child view controllers yourself. Each child you encode must have a unique restoration identifier. For more information about how the system determines which view controllers to preserve and restore, see App Programming Guide for iOS. The view that the controller manages. A Boolean value indicating whether the view is currently loaded into memory. Creates the view that the controller manages. Called after the controller's view is loaded into memory. Loads the view controller’s view if it has not yet been loaded. The view controller’s view, or nil if the view is not yet loaded. A localized string that represents the view this controller manages. The preferred size for the view controller’s view. The delegate object that provides transition animator, interactive controller, and custom presentation controller objects. Returns the active transition coordinator object. func targetViewController(forAction: Selector, sender: Any?) -> UIViewController? Returns the view controller that responds to the action. The nearest presentation controller that is managing the current view controller. The nearest popover presentation controller that is managing the current view controller. A Boolean value that indicates whether an item that previously was focused should again become focused when the item's view controller becomes visible and focusable. Notifies the view controller that its view is about to be added to a view hierarchy. Notifies the view controller that its view was added to a view hierarchy. Notifies the view controller that its view is about to be removed from a view hierarchy. Notifies the view controller that its view was removed from a view hierarchy. A Boolean value indicating whether the view controller is being dismissed. A Boolean value indicating whether the view controller is being presented. A Boolean value indicating whether the view controller is being removed from a parent view controller. A Boolean value indicating whether the view controller is being moved to a parent view controller. Position views so that they are not obstructed by other content. Custom insets that you specify to modify the view controller's safe area. Called to notify the view controller that the safe area insets of its root view changed. A Boolean value indicating whether the view controller's view uses the system-defined minimum layout margins. The minimum layout margins for the view controller's root view. Called to notify the view controller that the layout margins of its root view changed. The edges that you extend for your view controller. A Boolean value indicating whether or not the extended layout includes opaque bars. Called to notify the view controller that its view is about to layout its subviews. Called to notify the view controller that its view has just laid out its subviews. Called when the view controller's view needs to update its constraints. Returns a Boolean value indicating whether the view controller's contents should auto rotate. Returns all of the interface orientations that the view controller supports. Returns the interface orientation to use when presenting the view controller. Attempts to rotate all windows to the orientation of the device. Called when a split view controller transitions to a compact-width size class. func separateSecondaryViewController(for: UISplitViewController) -> UIViewController? Called when a split view controller transitions to a regular-width size class. The preferred interface style for this view controller. The child view controller that supports the preferred user interface style. Notifies the view controller that a change occurred that might affect the preferred interface style. An array of view controllers that are children of the current view controller. Adds the specified view controller as a child of the current view controller. Removes the view controller from its parent. Transitions between two of the view controller's child view controllers. Returns a Boolean value indicating whether appearance methods are forwarded to child view controllers. Tells a child controller its appearance is about to change. Tells a child controller its appearance has changed. Changes the traits assigned to the specified child view controller. func overrideTraitCollection(forChild: UIViewController) -> UITraitCollection? Retrieves the trait collection for a child view controller. Called just before the view controller is added or removed from a container view controller. Called after the view controller is added or removed from a container view controller. The parent view controller of the recipient. The nearest ancestor in the view controller hierarchy that is a navigation controller. The nearest ancestor in the view controller hierarchy that is a split view controller. The nearest ancestor in the view controller hierarchy that is a tab bar controller. Sent to the view controller when the app receives a memory warning. Returns the extension context of the view controller. The methods in this task group are available on devices that support 3D Touch. The end-user terminology for the views presented during the phases of force-based touches includes peek and pop. For clarity here, and to align with the API names, this document uses the corresponding terms preview and commit view. To learn more about 3D Touch, read Adopting 3D Touch on iPhone. Returns the child view controller that should be queried to see if its gestures should take precedence. Call this method when you change the screen edges that you use for deferring system gestures. Returns a Boolean indicating whether the system is allowed to hide the visual indicator for returning to the Home screen. Returns the child view controller that is consulted about its preference for displaying a visual indicator for returning to the Home screen. Notifies UIKit that your view controller updated its preference regarding the visual indicator for returning to the Home screen. The tab bar item that represents the view controller when added to a tab bar controller. A Boolean value indicating whether the view controller currently allows the user to edit the view contents. Sets whether the view controller shows an editable view. Returns a bar button item that toggles its title and associated state between Edit and Done. Associates the specified keyboard shortcut with the view controller. Removes the key command from the view controller. The name of the view controller's nib file, if one was specified. The view controller's nib bundle if it exists. Transition styles available when presenting view controllers. Policy options governing how and when interstitial ads may be presented from a view controller. Exceptions raised by view controllers. Constants that specify the edges of a rectangle. Posted when a split view controller is expanded or collapsed. func forUnwindSegueAction(Selector, from: UIViewController, withSender: Any?) -> UIViewController? func segueForUnwinding(to: UIViewController, from: UIViewController, identifier: String?) -> UIStoryboardSegue?